Restoration Robotics, Inc. announces a major milestone – the shipment of the 100th ARTAS® Robotic System to Hasson & Wong Aesthetic Hair Surgery in Vancouver, BC. 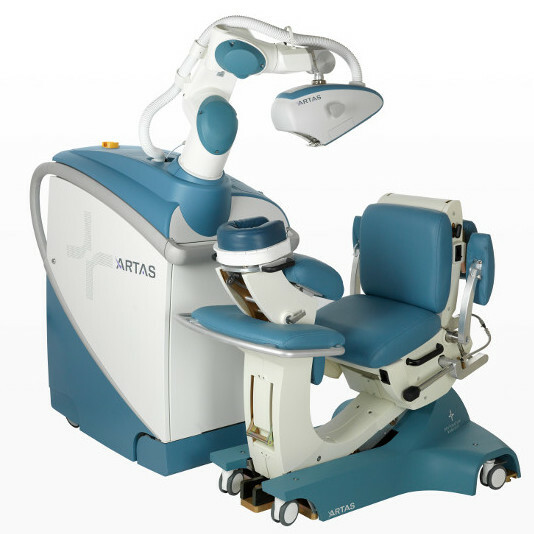 “We are excited to be the 100th center to receive the ARTAS Robotic System. Our patients travel from around the world to our center. They are astute, educated, and do their research, as do we. At the end of the day, our focus is on providing our patients the best possible outcomes and options. The ARTAS Procedure is the most advanced reproducible FUE surgery available. We are enthusiastic about the unique benefits we are now able to offer our patients and look forward to ARTAS contributing to substantial practice growth and continued patient satisfaction,” said Drs. Hasson and Wong when they received the good news. With the commercial launch in late 2011, achieving the 100th system demonstrates the ARTAS Robotic System’s widespread adoption among leading hair transplant experts. This transformative technology is currently cleared for use in forty-six countries, with additional clearances pending. Launched after almost a decade of research and development, the ARTAS Robotic System has revolutionized the hair restoration industry and continues to change the way men think about hair replacement. ARTAS is the first and only image-guided, physician-assisted robotic system for harvesting follicular units. This advanced technology brings a new level of speed, precision and accuracy to hair transplantation, helping to remove patient concerns like discomfort, recovery time, visible linear scars, and unnatural results. Using high-resolution digital imaging, the ARTAS Robotic System extends physician capability and removes the potential for human error attributable to fatigue. The physician-assisted ARTAS Robotic System uses state-of-the art image guidance and intelligent algorithms to optimize individual follicular unit harvesting resulting in precise procedures and consistent results. With the ARTAS Robotic System, physicians can harvest thousands of follicular units in a single session, performing the procedure with uniform results. The ARTAS Robotic System takes the guesswork out of the hair restoration process so that patients can be confident of the long lasting and aesthetically pleasing outcomes. Each hair is removed individually, ensuring that there is no visible linear scar and allowing patients the freedom to wear their hair in any style they like – long or short. Patients can return to their work, exercise and daily activities immediately. Restoration Robotics, Inc., (San Jose, CA) is a privately held medical device company dedicated to transforming the field of hair transplantation. The company produces the ARTAS® Robotic System, the first and only image-guided, physician-assisted system to harvest follicular units. After rigorous testing and clinical trials, the ARTAS Robotic System earned 510(k) clearance from the Food and Drug Administration in 2011. Clinical studies were conducted from 2006 to 2011 to prove the efficacy and safety of the system. Restoration Robotics has also secured a Canadian Medical Device License, the CE Mark certificate for the European Union and KFDA (from Korea) clearance in 2012. The ARTAS Robotic System continues to propel hair restoration into the future, generating reproducible, natural-looking outcomes with a new level of speed, precision and accuracy. To experience the ARTAS Robotic System difference, please click here.